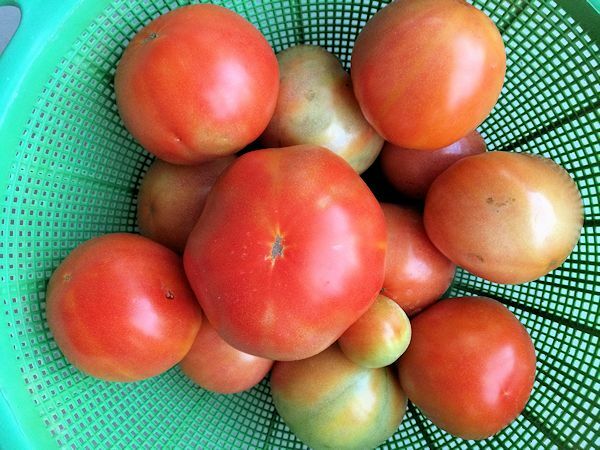 Tomatoes are in season and pimento cheese is a summer favorite. So why not combine the two for a new twist on a classic sandwich. 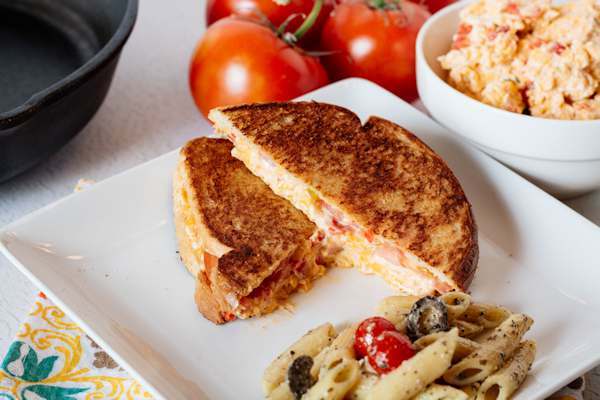 I love making Pimento Cheese in the summer for a quick lunch or supper. We all have so many outdoor activities during the summer and this sandwich is a perfect choice. Especially when its hot outside and I don’t like cooking over a hot stove for a long time. And since its summer, my tomato plants are heavy with tomatoes and I’m so glad my DIY tomato cage is holding all that goodness off the ground. We can only eat so many tomatoes and I only put up a few, so I needed to use them up somehow, so why not add them to a pimento cheese sandwich. Pimento cheese is a staple in our home and so much better than store-bought. By making my own, I know exactly what is in my spread and don’t have to worry about all those preservatives. I use a skillet to make these grilled sandwiches which makes a lovely golden brown color on the bread. But I do suggest using a non-stick pan or griddle if you don’t have a skillet. I have also used my George Forman grill if I am making more than 2 sandwiches since it will hold 2 at a time. If you want to use olive oil instead of butter, try an Olive Oil Spritzer which helps with coating the bread and pan easily. Add all ingredients in a bowl and stir to combine. Adjust taste with salt, pepper, and hot sauce. Chill until ready to serve. Preheat pan or skillet (my choice) over medium heat. Spread an even amount of pimento cheese on all slices of bread. Whole wheat bread is my favorite. Add sliced tomatoes on 2 of the slices of bread. Place the other bread slices on top. Spray the hot pan with olive oil and place a sandwich in the skillet. Then spray the top slice of bread with olive oil using an olive oil spritzer. Butter is also an option to use. Cook each side about 2 or 3 minutes until golden brown. Serve warm. This recipe can be made with low-fat cream cheese and low-fat mayonnaise and there really isn’t a taste change. If Mr. G can’t taste a difference, then all is good. I also love serving this spread with crackers and celery sticks at a party. Just remember if you are serving this outside to make sure it stays cool until serving time and to serve it on an ice tray to keep your spread cool. Tammy, I have made this sandwich before BUT never grilled it! I put tomatoes on everything once they start coming in. I haven’t made my own pimento cheese, but that will start this weekend. Looking forward to trying this yummy goodness. I make a great fresh pimento cheese spread and never thought about grilling it. Now this has to be made and eaten this weekend. Sounds delicious. This would make a nice addition to my Back to School Party I am creating for the parents in our neighborhood or for the teachers on the First Day of School as I am putting together snacks for them. This is a great flavor combination for grilled cheese. We’ll be giving it a try this week. Thanks for the recipe! Oh yes, this would be the perfect lunch for me! 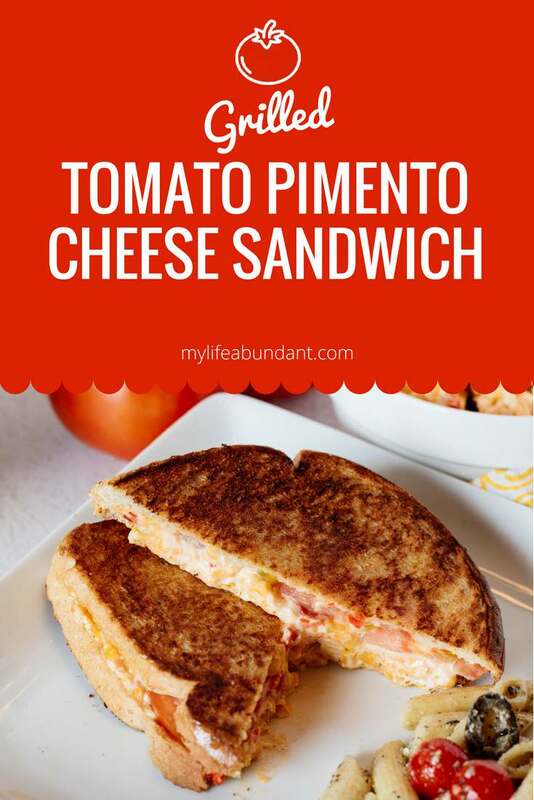 I just love grilled cheese sandwiches, and I love tomatoes, so this would be a tasty combo! YUM! This sandwich looks SO good! I love tomato sandwiches in the summer time! This sandwich looks good! I haven’t had pimento cheese in a long time, my mom use to make these sandwiches. I wonder if I can get the kids to eat one. Oh wow now this sounds right up my street. I have to admit when anything mentions cheese I am like – well yup I definitely need to give that a try. Oh boy one of those looks so good right now! I love these ingredients! I will absolutely have to make this! Grilled tomato is so underrated! My tomatoes are also plentiful this year. I love that you added them to a cheese pimento sandwich. I’ve never had a pimento sandwich but it sounds delicious! I love grilled cheese, it’s such a comfort food and it’s easy to make as well. This sounds so lovely and I like the grilled tomato as well, it adds such a nice flavor! I love me a good grilled cheese! The addition of pimento sounds incredible. Thanks! I love your tomato cages! I should ask my husband to make me some lol. My tomatoes are still green. This looks like a sandwich I would make for company luncheons. I have a neighbor who pops in at meal time (she lives alone and elderly). She loves tomatoes more than anyone I know so she’s really going to enjoy these. Oh my goodness, this sandwich sounds so yummy! I LOVE pimento cheese. It took me a couple of years living in the south to actually TRY it, but now it’s a favorite. I’m sure it would be amazing in a grilled cheese sandwich! I really enjoy a hot and toasty pimento cheese sandwich, but I would have never thought about adding tomato! That’s a great idea! Yum!! It looks so good and it definitely made me crave! I love the combination of fresh tomatoes and cheese in sandwich. I’d love to make this!